OPINION— In case you haven’t caught up on the latest news during the last fifty years or so, climate change is the greatest threat mankind faces, or has ever faced, or will ever face, outside of a Miley Virus music video. Anthropogenic (human-caused) climate change is why it’s getting hotter in the summer (or colder), colder in the winter (or hotter), drier in the spring (or wetter), and causes poor coffee production. Climate change is the reason there are fewer trees (even though there are more trees), rising water levels (although water levels aren’t rising), and scientists have now determined that, for every person who says climate change is not an issue, one sock out of a pair disappears from your drier. So, to sum up, climate change is bad, and it’s your fault. And now Netflix has found something else to blame climate change (and therefore you) for: walrus suicide. Since you don’t care enough to quit driving your SUV around, destroying the atmosphere, walruses are killing themselves. Don’t believe me? Watch the new Netflix series called ‘Our Planet.’ You’ll see. Now, I didn’t, personally, watch ‘Our Planet’ on Netflix. I have standards. But you can go on YouTube and watch a short ‘behind the scenes’ video, which shows the people who filmed the movie, watching the walruses doing themselves in. They feed in the water, and rest on land, and there’s a spot someplace where the walruses like to rest next to a cliff. For some reason a bunch of them started climbing up on the cliff, about a hundred feet up, and occasionally one of them falls off the edge, and hits the rocks below. Honestly, it’s a sad thing to see, and I don’t recommend it. David Attenborough, who narrated the movie, says the walruses are climbing the cliff and committing suicide because the sea ice is melting. Only it doesn’t look, in the video, like they’re jumping off the cliff on purpose. It just looks like they’re poor climbers. Which you would kind of expect, with your standard walrus, after all. But since no one knows why the walruses are climbing the cliff and falling off, Netflix seems to have decided to blame it on climate change. Why not? But maybe there’s another explanation. 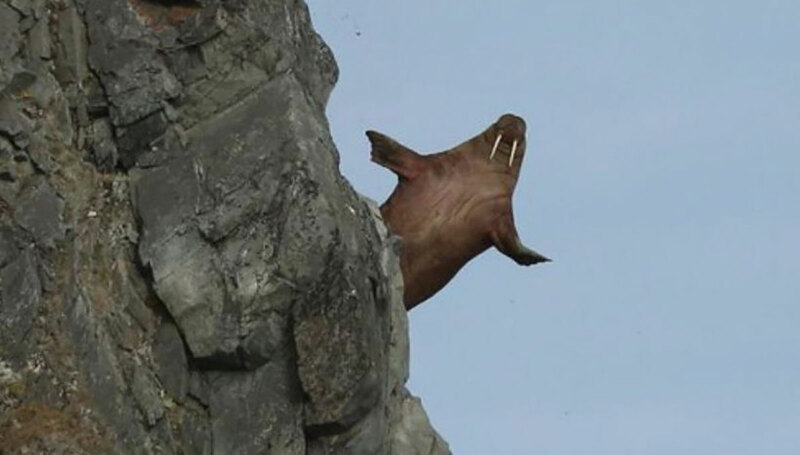 Maybe walruses just aren’t very smart, and don’t know any better than to climb up on whatever rocks they happen to be around, and since they’re pretty clumsy, they fall. I don’t know. And walruses aren’t the only ones doing stupid things lately. There’s an animal rights group called Defenders of Wildlife, which claims to defend wildlife. And when they heard about a pack of gray wolf pack that was killing cattle around Butte Falls, Oregon, DofW decided to help out. Not personally, of course. What they did was talk a rancher named Ted Birdseye into using inflatable dancing men to scare off the wolves. Really. You know those tall, thin balloon things, with faces and flailing arms, they put out by car lots and stuff to attract attention? They’re hooked up to a fan or something, and they gyrate and shake all over, falling and standing up again. Well, DofW donated some of those, and they put them out in Ted’s pastures, to scare the wolves away. It didn’t work. Big surprise. Ted’s hands are pretty much tied, since the wolves are entirely protected in the federal Endangered Species Act. The U.S. Fish & Wildlife Service plans to propose a rule to delist wolves in the lower 48 states, which would allow nuisance predators to be controlled in certain cases, but right now you can’t shoot a wolf even if it’s packing off your child for dinner. Legally, I mean. And when the USFWS suggests controlling the wolves, activist groups like DofW will come out of the woodwork, tying the issue up in court for years. Ted’s pretty much out of luck, and will soon be out of cattle. 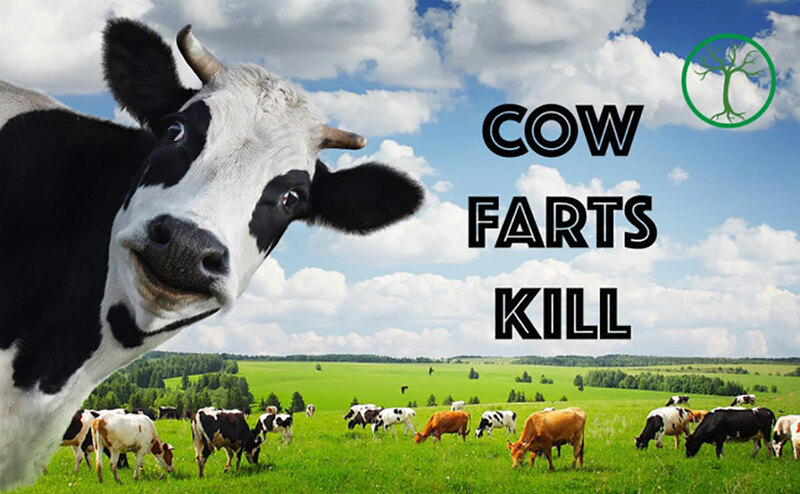 I think the wolves are Alexandria Ocasio-Cortez’s plan to wipe out the cattle population in the US, thereby ridding us all of the evils of cow flatulence. That’s a major part of her Green New Deal plan, after all. I don’t have any proof, but if Netflix can show a video of some walruses falling off a cliff and claim, without evidence, that it’s because of climate change, then I can blame AOC for the wolves in Oregon killing Ted Birdseye’s cattle. I’d climb a cliff and jump off, but I’m really not all that good a climber . . . Same thing happened 8 million years ago, no one said anything then, why now? At least, you can find the humor in all the stupidity, good article Kendall.